On Thursday night MSNBC's cast and crew gathered in Washington D.C. to celebrate their network being on the air for 15 long years. In that time its hosts, reporters and guests have attacked conservatives and Republicans on everything from impeaching Bill Clinton and conducting a war on terrorism, up to the fight over public unions. All the while some of its reporters and hosts have been thrilled by the likes of Mikhail Gorbachev and Barack Obama. For that entire 15 years MRC analysts have been dutifully watching and noting these often outrageous outbursts of leftism from NBC News' cable outlet. The following collection of the worst MSNBC quotes, year-by-year, is just a sampling of the Lean Forward network's decade-and-a-half long devotion to advancing the cause of liberalism under the guise of journalism. -- Bryant Gumbel to reporter Lou Cannon, October 10 MSNBC InterNight. "But isn't that going to only exacerbate the feeling, especially in the cities in this country, that there is a growing schism between the haves and the have nots because we're going to mandate welfare reform. We're going to mandate a lot of immigration reform but there's going to be no money that comes in behind it." - NBC anchor Tom Brokaw on welfare and immigration reform, to New York City Mayor Rudy Giuliani, March 3 MSNBC InterNight. "Can Ken Starr ignore the apparent breadth of the sympathetic response to the President's speech? Facially, it finally dawned on me that the person Ken Starr has reminded me of facially all this time was Heinrich Himmler, including the glasses. If he now pursues the President of the United States, who, however flawed his apology was, came out and invoked God, family, his daughter, a political conspiracy and everything but the kitchen sink, would not there be some sort of comparison to a persecutor as opposed to a prosecutor for Mr. Starr?" - Keith Olbermann on MSNBC's Big Show, to Chicago Tribune Washington Bureau Chief James Warren, August 18. Cliff May of the Republican National Committee: "We have right now a credible allegation by Juanita Broaddrick that while Attorney General, Bill Clinton sexually assaulted her and he won't answer." MSNBC host David Gregory: "Now hold on. You know what, Cliff? I'm not going to let you go there. We are not talking about this today. We're not going to turn that into this. I want to go around the horn a little bit. Cliff, wait a minute. Cliff, I'm going to stop you. I'm hosting the program. It is not a double standard. We have a clear focus today. I'm asking the questions." - MSNBC afternoon discussion of allegations about past illegal drug use by Republican presidential candidate George W. Bush, August 19. "The one thing that most, that I've learned about Cubans in the many times that I have visited here in the last few years, is that it is mostly a nationalistic country, not primarily a communist country." - NBC News reporter Jim Avila on MSNBC's simulcast of Imus in the Morning, April 26. "He's only the most important political leader alive in the world today, historically speaking....If you look over the course of our lifetimes, who was the most, well, you go back to Lincoln and Franklin Roosevelt....If I look back over my lifetime, who is the world leader who changed things the most, and I don't actually think it is a close call." –- Newsweek's Jonathan Alter on Mikhail Gorbachev, April 27 Imus in the Morning on MSNBC. Phil Donahue: "Let me tell you what is impressive. You're not wearing a flag. Well, I don't want to damn you with my praise, but I say hip-hip-hooray for that, and I think you gave the right answer when you spoke at Northwestern University...."
Tom Brokaw: "Right. I said, you know, I wear a flag in my heart, but I think if you wear a flag, it's a suggestion somehow that you're endorsing what the administration is doing at the time. And I don't think journalists ought to be wearing flags." Donahue: "And I say hear, hear, hear." - Exchange on MSNBC's Donahue, July 25. "The size of the demonstrators, at least here, at least in Europe, seems to underscore, Chris, that there are now perhaps two world superpowers. There's the United States and then there are those millions of people who took to the streets opposing U.S. policy." - MSNBC's David Shuster with Hardball host Chris Matthews, February 17. "What happens when you go in the Oval Office is you start living in a bubble, you know....David Kay, for instance, comes out with a report and says Iraq never had weapons of mass destruction. What does George W. Bush say? 'Well, I still think they had them.' That's not just spin. That's dementia." - MSNBC contributor Ron Reagan, Jr., during live coverage of the January 27 New Hampshire primary. Anti-war activist Cindy Sheehan: "We're not going to cure terrorism and spread peace and good will in the Middle East by killing innocent people or — I'm not even saying our bullets and bombs are killing them. The occupation — they don't have food, they don't have clean water, they don't have electricity. They don't have medicine, they don't have doctors. We need to get our military presence out of there, and that's what's gonna start building good will....I see Iraq as the base for spreading imperialism...."
- Exchange on MSNBC's Hardball, August 15. "We now face what our ancestors faced at other times of exaggerated crisis and melodramatic fear-mongering: A government more dangerous to our liberty than is the enemy it claims to protect us from....We have never before codified the poisoning of habeas corpus, that wellspring of protection from which all essential liberties flow. You, sir, have now befouled that spring. You, sir, have now given us chaos and called it order. You, sir, have now imposed subjugation and called it freedom....These things you have done, Mr. Bush — they would constitute the beginning of the end of America." - Keith Olbermann in a "Special Comment" on the setting up of military trials for terrorists held at Guantanamo Bay, MSNBC's Countdown, October 18. "When I watched him [former President Bill Clinton] at Mrs. King's funeral, I just have never seen anything like it....There are times when he sounds like Jesus in the temple. I mean, amazing ability to transcend ethnicity — race, we call it, it's really ethnicity — in this country and, and speak to us all in this amazingly primordial way." - Chris Matthews, MSNBC's Hardball, Feb. 28. Co-anchor Chris Matthews: "I have to tell you, you know, it's part of reporting this case, this election, the feeling most people get when they hear Barack Obama's speech. My — I felt this thrill going up my leg. I mean, I don't have that too often. Matthews: "No, seriously. It's a dramatic event. He speaks about America in a way that has nothing to do with politics. It has to do with the feeling we have about our country. And that is an objective assessment." - Exchange during MSNBC's coverage of the Virginia, Maryland and Washington D.C. primaries, February 12. "The Republicans lie! They want to see you dead! They'd rather make money off your dead corpse! They kind of like it when that woman has cancer and they don't have anything for her." - Ed Schultz, host of MSNBC's The Ed Show, September 23. "What would you do, sir, if terrorists were killing 45,000 people every year in this country? Well, the current health care system, the insurance companies, and those who support them are doing just that....Because they die individually of disease and not disaster, [radio host] Neal Boortz and those who ape him in office and out, approve their deaths, all 45,000 of them — a year — in America. Remind me again, who are the terrorists?" 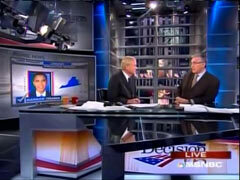 - MSNBC's Keith Olbermann in a "Quick Comment" on Countdown, January 5. Clip from RNC ad: "Stop Obama and his union bosses today. The Republican National Committee is responsible for the content of this advertising." Ex-Governor Jennifer Granholm (D-MI): "Wow, I hadn't thought about the racial overtones...."
- MSNBC's The Last Word, February 25.